MagSwitch is the name we first associate switchable magnets and their use in jigs and fixtures, but it looks like Chestnut Tools want to give them a bit of competition. And what better way to kick things off then with a buy one get one free deal from Lee Valley? While we have seen some re-branding of the MagSwitch magnets, the Chestnut variety is a completely new take on the magnetic switch that will have you choosing which design you prefer. 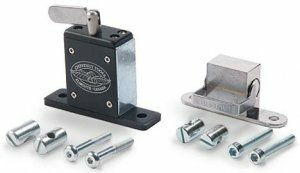 While the most basic MagSwitch brand magnet requires you to drill through your jigs for mounting, the Chestnut version has a flatter design and is mountable from the side. With this flat design you can more easily attach the magnet to jig thicknesses of any size. Chestnut Tools is currently offering their switchable magnet in two sizes/strengths. Their largest model has a holding strength of more than 150 lbs and is less than 3/4" thick, it has a flange width of 2-5/8". The smaller size has a holding strength of 38 lbs, is 5/8" thick and has a flange width of 2-9/16". Now until Jan. 4th 2012, if you purchase the large magnet ($24.50) from Lee Valley, you will also receive the small one ($14.50) for free.